Any material used to adorn oneself may be called a jewelry. Usually the material is precious material like gemstone or noble metals but modern jewelry can be made of any material. Jewelry may be made using clay, ceramic, porcelain, acrylic, plastic, crystal, glass, metal, rhinestone, seeds, shells, bone, corals, stone or wood. Sometimes they may be made from jute, paper or other natural products. The time when jewelry was first used is not known but the remains of mollusk jewelry discovered in the caves of Blombos in South Africa dates the existence of jewelry for over 100 thousand years. Ancient jewelry was made from animal tooth, bones, shells, ivory, carved stone and wood. Metallic jewelry is believed to have existed for nearly 5000 BC. The modern costume, imitation, fashion or fake jewelry started in the 17th century and was made out of glass. By the 18th century semi-precious jewelry came into existence. The various types of jewelry items include hairpins, bracelets, earrings, jewelry sets, necklaces & pendants, pins & brooches, rings, anklets, watches etc. Men use belt buckles, cufflinks, tie clasps, pendants, pins, ring, chain and bracelets. The famous silver lac combs are famous amongst the women folk. These combs have flower motif in the centre which is further beautified with the red color gem stone. Manipur produces pure gold and gold plated jewellery which is a great craft in its own. 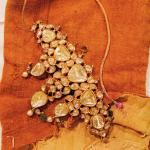 State museum is witness to this craft as there is old designed jewellery on display. The Sikkimese use lot of precious and semi precious stones in their ornaments. Popular are the bagels which are made of seven metals.